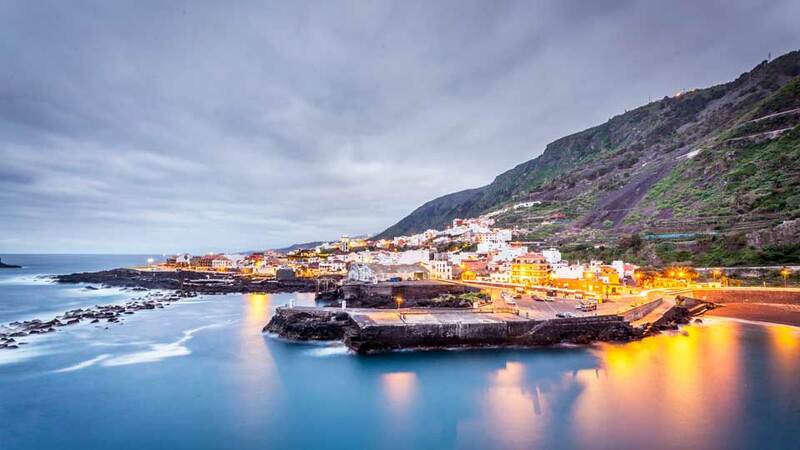 Situated in a deep valley skirted by forested slopes and a rocky coastline, Garachico is an elegant, peaceful town full of traditional Canarian flair. A former fishing village, this town on the northwest of the island is surrounded by beautiful, pristine landscapes of Tenerife. Situated among towering volcanic rocks and natural lava pools are historic buildings and monasteries. Its cottages and traditional houses are painted in bright hues and pastel colors which are a delight to the eyes. Garachico’s immaculate narrow winding cobblestone paths lead the way to chic boutique hotels and plazas lined with palm trees. As such, stepping into Garachico is like setting foot on a large, open-air museum. Already, the town has received accolades for its continuous effort in preserving its heritage. Despite the arrival of tourists, the air of relaxation and tranquility is still evident. It is perhaps one of the reasons why this town is a favorite of day trippers who wish to have a break from the buzz of the city. Garachico is a sleepy traditional town where nothing seems to go wrong. But it has had its fair share of tragedies in the past since its founding in 1496. Over the last centuries, it endured disease outbreaks, locust plagues, and pirate attacks. Even so, these are nothing compared to what happened in 1706. Serving as the main port of Tenerife, Garachico was bustling with trade. As such, it became home to wealthy merchants, clergymen, titled families and artists until the catastrophic eruption of Montana Negra Volcano. For nine days, it spewed toxic ashes and buried almost the whole village under fiery lava. In the aftermath, only a part of the town’s gate remained standing. Its complete destruction paved the way for the rise of Puerto de la Cruz, which took over as the main port of the island. Still, the survivors in Garachico showed their resilience by rebuilding and shifting to banana and sugar cane plantations. Throughout its rich and tragic history, Garachico has endured both man-made and natural adversities. In spite of that, its people have learned to turn challenges into opportunities. Today, its past is showcased in the beautiful houses, museums, and plazas. It is also one of the reasons why it attracts thousands of tourists. 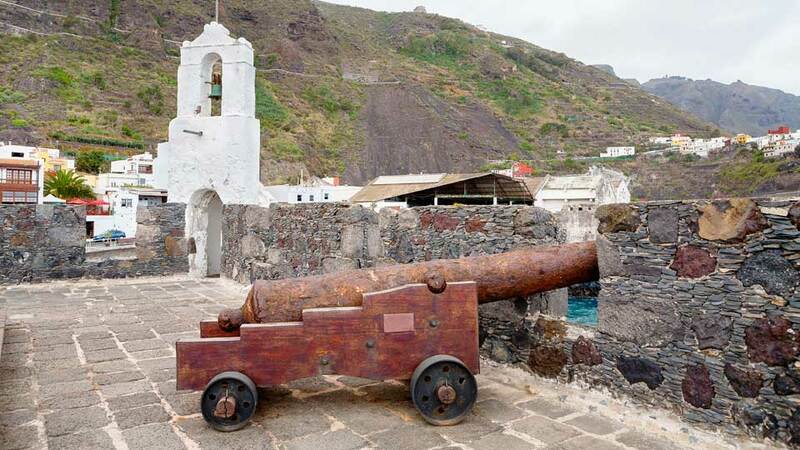 In the 16th century, the flourishing port of Garachico and its wealth became a magnet for marauding pirates. Hence, the town built a stone fortress, Castillo de San Miguel, to defend itself. Today, this well-preserved fort serves a museum of natural history that boasts views of the ocean and the solitary islet of Roque de Garachico. For only €2, visitors can learn more about the history, flora, and fauna of the Garachico. Ancient eruptions led to the creation of El Caleton de Garachico, a collection of marvelous lava rock pools by Castillo San Miguel. Enhanced by the locals, this attraction offers safe bathing condition so long as the Atlantic Ocean is its usual calm self. Moreover, the pools have lifeguards to ensure that visitors of all ages will have an exciting and worry-free experience. Here, visitors may take a refreshing dip while savoring the views of the northern coastline. Garachico is as captivating from afar as it is up close. At the height of 460 meters, Mirador de Garachico offers people a marvelous view of the rustic town, the deep blue ocean and the majestic Mount Teide beyond. Feast your eyes with the view while tantalizing your taste buds with exquisite food and wine at the viewpoint restaurant. Better yet, complete the experience by visiting the souvenir shop selling delightful products made by local artisans. Formerly known as Plaza de Santa Ana, this charming spot was a part of Iglesia de Santa Ana until lava flows separated them. Since then, it has undergone several name changes and improvements. Today, bay trees shade Plaza de la Libertad as it is now called. Standing in the middle is a bronze statue of Simon Bolivar. The plaza is also a hangout and meeting place for locals with wooden benches all around. Iglesia de Santa Ana is not the only place of worship around the Plaza de la Libertad. On the western side stands the eye-catching Convento de San Francisco. It’s brightly-colored pastel walls accentuated by large wooden doors, and tall palm trees are simply picture-perfect. Inside, visitors step back in time with old photographs and fading maps carefully displayed in the museum. Also, the former convent features a lovely inner courtyard which is a perfect spot to cool down after a few hours of exploring. 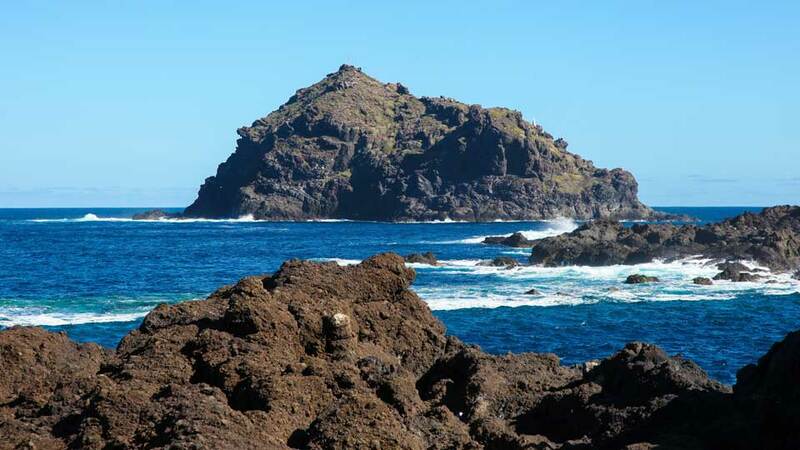 From a distance, Roque de Garachico looks like a small, uninhabited island off the northern coast. To the locals, this three-hectare lozenge of land that emerges out of the ocean is another reminder of the town’s resilience. During the Spanish conquest, Guanches defeated a small group of conquerors who then fled to and were trapped on the island, knowing that the aborigines were non-swimmers. With the stories woven around it, this 120-meter high rock island is now a protected natural monument. Among the many things Garachico is known for, its old quarter consisting gorgeous traditional houses are what brings most tourists to town. Casa Palacio de Los Condes de La Gomera, to the north of Plaza de la Libertad, is one of the most impressive Canarian-style mansions. Built in the 17th century, the Corinthian columns and symmetrical architecture of the house is an excellent example of traditional architecture. Situated closer to the bay is the bucolic Casa de la Familia Ponte. From a fortified tower, guests can observe the ships moored at the port. Also, housed here are antique furniture, expensive china, and paintings from the 17th and 18th Century. The easiest way to get to Garachico is by hiring a car. Driving from Puerto de la Cruz, visitors can take the TF-5 motorway which should take only a little over 30 minutes. From Santa Cruz, take the TF-21 then TF-5 motorways passing by Puerto de la Cruz. This route takes more or less 75 minutes. Visitors coming from the south may take TF-82 that will lead to Garachico in just over an hour. For a more cost-effective option, guests may take the convenient and reliable TITSA Bus no. 363 that runs every hour from Puerto de la Cruz. From Santa Cruz, Bus no. 107 departs every 2 hours and with stops at North Airport, La Orotava, and Icod de Los Vinos. Getting around Garachico is easy. The town and harbor are small enough to walk from one end to the other in less than 20 minutes. Tourism is one of the leading source of income in Garachico, aside from agriculture. Hence the government made sure that there will be enough holiday rentals to accommodate its visitors. From posh hotels to cozy apartments, this town caters to visitors from all walks of life. Set in a stunning 18th-century Villa, Boutique Hotel San Roque offers an elegant façade located just 5 minutes from the beach. It features an outdoor swimming pool, terrace and lovely ocean views. Named as one of the best boutique hotels in the world, Hotel San Roque has offers stylish and comfortable accommodation for everyone. Hotel La Quinta Roja is a beautifully restored 16th-century mansion on the coast of Garachico. It was also once the historic home of the Marquis of Quinta Roja. After a day of exploring the town, guests can take a stroll on the courtyard featuring a charming marble fountain and a well-manicured terrace garden. Also, they can use the sauna and jacuzzi or take a dip in the nearby public swimming pool next to the sea. Overlooking the sea and within an easy stroll to the main points in town, Apartamento San Roque is a favorite among guests who want the best bang for their bucks. The apartment terrace overlooks the ocean and the beautiful neighborhood. Aside from free WiFi, shared kitchen and living room areas, bike hire is also available for those who want to paddle around the town. The warm and welcoming atmosphere at Apartamento Vistas de Garachico is what makes guests keep coming back to this holiday rental. Its pool and outdoor terrace are just bonuses. Not only are the rooms clean and comfortable, but guests can also expect the staff to go out of their ways to make each and every stay unforgettable. With its location on the coast of Tenerife, it is no wonder why the restaurants in this town specialize in one variety of dish: seafood. Every bistro, seafront or located on the mountaintop, rustic or modern, have their own signature fish or seashell dish. Indeed, this town is a seafood lover’s paradise. Restaurante Ardeola may not be visitors’ daily lunch option because of the menu price, but it is worth trying even once. This elegant restaurant offers mouthwatering seafood dishes with beautiful views of the ocean. They also have a wide variety of wines to complement the meal. Located at one of the best viewing spots in Garachico, visitors can enjoy contemporary and healthy cuisines while admiring the view of the town below. Besides the warm and homey atmosphere, they also offer wine, coffee, tea, and irresistible desserts served by courteous staff. To enjoy great food accompanies by superb views, head over to El Caleton, a seaside restaurant. Here, diners enjoy the best views of the Atlantic waves crashing over natural rock formations. The restaurant offers an excellent choice of seafood and meat dishes at a reasonable price. Their home-made desserts and excellent service also make this restaurant a favorite among locals and tourists. Casa Ramon is more famous for its creaking and antiquated ambiance than for its food. The wood-paneled dining room of this little restaurant is a throwback to a bygone era. Their music comes courtesy of an old cassette player, and bills are written on scraps of paper and coffee is unheard of. The best thing about Garachico is not its well-preserved stately mansions nor its leafy plazas. It is the people who don’t mourn the eruption and other calamities that destroyed it in the past. Instead, the Riscos de Fuego festival commemorates the tragedy. Every five years, locals throw fireballs down the cliffs to follow the path the lava took in 1706. This northern gem is perhaps Tenerife’s most optimistic town. Despite a history of setbacks, some of which are of biblical proportions, this once wealthy Garachico has always managed to turn adversity into opportunity.